Haiti - Compas Music vs Religion : Why do Haitian musicians abandon Compas Music when they convert into Christianity? 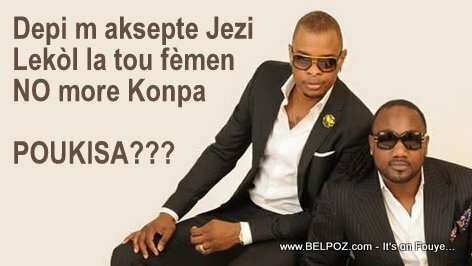 Here is something that I do not understand with Haitian music stars, as soon as they accept Jesus Christ as their Lord and savior (konvèti) they abandon compas music like music is the devil. Why is that? Ayiti - Konpa Mizik kont Relijyon: Poukisa mizisyen ayisyen abandone Konpa lè yo konvèti? I watch the American Music Awards all the time. Whether it is country music, hip-hop, R&B, Rock and Roll, you name it, the American music stars always thank God first whenever they receive a music award. Aint none of them feel that they are involved in something that is so wrong that they have to abandon it for Jesus. Who says you have to quit playing compas music just because you are a Christian? Why do Haitian music artists do it? Yes exactly you mentioned it, MUSIC is the DEVIL. I am a Christian myself. I read Your article and wanted to respond the best way i can. No music is inherently satanic. This is the fact for African people all over the world(And yes we are still A Africans even though we are born in Haiti, But we are the only people who don't know our selves, for example we are the only race that have a so-called God that do not look like us. Some white jeasus, the lie because jesus was not white at all. But we African people in the world need to start loving our selves, Who give us the talent in the first place, it was not some white-Jesus, Africa is the cradle of man kjnd, So-called white people know it but we African people don't, anymore that's what Colonialism has given us, hate our selves and love everyone else. Indian, Chinese, Europeans. The answer to this inquiry is that the so-called evangelical brand of Christianity is a mixture of number of number American culture and a narrow interpretation of biblical tradition. This combination relegate all non european matters as being of the devil. I also would like to understand why the Haitian Christian community portrays Compas music as the devil's music? My husband is a music producer and a compas band owner, and many of my family members are against our relationship because he is a musician.